This was a big hit at last month’s Carroll Cafe. I even had people coming back for seconds. So I’m apparently not the only one that loves Thai food. And while this might not be a traditional dish, it is packed with flavor, texture and crunch. 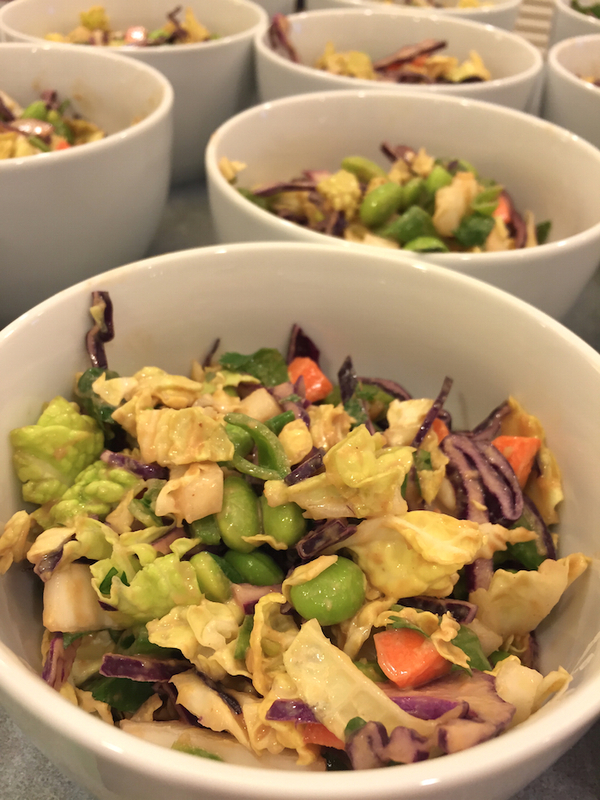 Cabbage is great for mixing up the usual salad routine. I love using Napa cabbage which is more tender than red or green cabbage. Edamame, or soy beans, are a great source of protein, and I love the way they taste. This salad is hearty enough that it can be dressed ahead of time. It’ll last a day or two with the dressing on. However, if you’re not planning on serving it to a crowd, I’d recommend dressing individual portions as needed. In a small bowl, whisk together the dressing ingredients. Pour dressing over the salad and toss to combine.